Successive Roman emperors tried to squelch the growing belief in Christ as Lord during seven different periods of persecution. One manner in which Christians were discovered was by their refusal to swear to the divinity of Caesar. Though an annual swearing to Caesar was interpreted as a symbolic act of patriotism to most polytheistic Romans, it was an act which nevertheless carried the death sentence for a person's refusal to make. Later, by the mid-third century, various Roman emperors began vacillating between tolerance and hatred for Christianity. Five intermittent periods of persecution followed. After the death of Maxentius in the early fourth century, Constantine finally established the legal right for Christians to exist and to worship Christ. Once Christianity's death penalty was removed, the news of Christ could now be more easily shared throughout the Roman empire. To this end, biblical writings began to be translated into the languages of different peoples. The translation by Jerome, circa AD 400, was in the Latin language and was referred to as the Latin Vulgate. Vulgate means "common" which signified that this translation, rather than original Hebrew or Greek writings, was meant for the common man who, in this particular region, spoke Latin. The most influential church by this time, though certainly not the only one, was the Church of Rome. (The Church of Rome is also called the Roman Catholic Church. The term catholic, meaning universal, originally referred to the body of believers worldwide, as first coined by Ignatius in the second century.) The Christian church in Rome received extraordinary wealth and influence when Emperor Constantine moved his capital out of the city and turned over to that church his basilica and a great deal of treasures. While the Church of Rome had once declared Greek to be its official language, Greek culture waned. The Church of Rome reacted to this by accommodating the predominance of the Latin language and officially adopting it as its new official language sometime before the year 600. Jerome's Latin Vulgate was its official Bible translation. The zeal with which vast numbers of people were by now coming to faith in Christ heralded something remarkable. A commonality of thought was taking hold throughout regions where the Latin-translated Scripture was being circulated; largely the western world. People of different regions and different cultures were becoming united in a way like none before - by principles and common ideals. This became a moral force that is said to have spelled the beginning of the end for the age of barbarism. The Judeo-Christian worldview of an unchanging God and an orderly universe started to replace the prior consensus that the world was unpredictable and without purpose. This simple difference of perspectives would eventually propel Christianized nations to unparalleled advances in almost every field of study, especially the sciences. But it was in recognizing the public's growing allegiance toward Christ and the power of commonly held principles that certain medieval figures were able to exploit the new zeitgeist for less honorable purposes. Some leaders honestly aligned themselves with Christ and his principles. By doing so, they naturally accrued the respect of the growing number of those who believed likewise. Other figures found sufficient success by merely aligning themselves with the outward act of allegiance. In modern language, to win the religious right of ancient times, a king's flattery did not need to be genuinely directed towards Christ above, it just had to look like that to Christians below. For instance, certain leaders sought public devotion and allegiance by appearing before popular religious leaders to get divine approval for everything from trite possessions to declarations of war. Because the Church of Rome had acquired a high profile because of the great wealth Constantine had given it, it attracted far more national leaders than other churches. As kings and leaders used approval-seeking acts to gain favor at the hand of cooperative religious leaders, these religious leaders were now encountering and succumbing to the new temptation to ask for and receive special favors in return. Some within the Church of Rome desired the unification of all Christendom under its sole leadership. Many kings desired the expansion of their empires and riches. These desires would eventually entwine themselves into the cruel but mutually effective exploitation of people's genuine faith in the periods known as the Crusades and the Inquisitions. 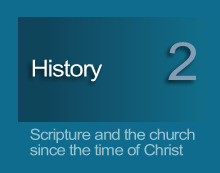 Previous chapters under INTEGRITY recalled the biblical writings' earliest formation. This chapter picks up right after the death of Christ and in particular discusses early church/state relationships.